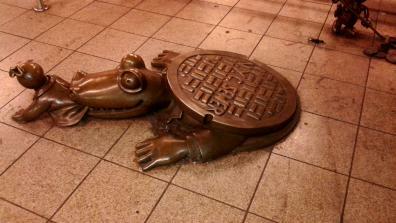 There is a zoetrope in the subway. 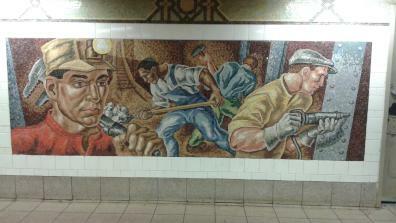 It is between the DeKalb Avenue station and the East River, on the Q and B line. Shortly after the station, narrow and evenly spaced slots start to appear in the wall, revealing to the observant traveler a lighted corridor running parallel to the train line. There are images all along the far wall. As the train moves, these simple geometric constructions in bright primary colors become animate. They dance with you as you move. They culminate in a big, blue, child’s-storybook rocket taking off; orange and yellow spirals of fire propelling it toward the Manhattan Bridge. Made in 1980 by Bill Brand, the zoetrope (he calls it his Masstransiscope) was restored from dirt, tags and general indistinctitude in 2008. It is a beautiful thing to behold – a transformation of subway tunnel grime to luminosity, appearing shortly before the sound of the carriage wheels announces the bridge’s open iron-work, views of the East River and, with a collective intensity of focus, a return to cellphone coverage. 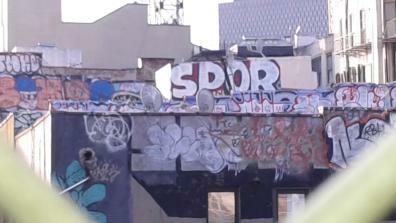 Approaching the western end of the Manhattan Bridge, you pass rooftop graffiti at eye-level. It is a remnant from a former time, a more anarchic and sometimes threatening period in New York’s history when whole subway cars were covered in tags and pictures inside and out, and often had police standing guard inside them. There is not a lot of street level graffiti in New York these days and this chaotic, washed-out, and less-than-stellar rooftop fragment on the descent into the Canal Street station reinforces for me the loss of what once was. Just over a year ago the owners of a five-story brick factory building in Long Island City, known popularly as 5 Pointz (aka The Institute of Higher Burning), erased a 10 year-old repository of graffiti art. The diverse and wonderful collection was all whitewashed early one morning, prior to the building being demolished. It was their private property. They could do that. You could get there by taking any of four trains to where the subway lines converge at Court Square in Long Island City. In an era where there are businesses devoted to removing it the moment it appears, a safe place for graffiti seems a good idea. In a city where there are public and dealer galleries everywhere you look, why is a record of the glowing if ephemeral art of the streets of such low status that it can be knocked down so casually? 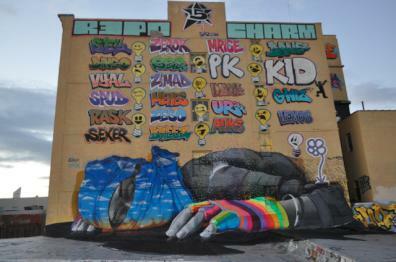 There was a last-ditch court case to protect 5 Pointz. The federal judge, Frederic Block, was clear that the building would be demolished because it was private property, but he expressed remorse at the loss of the artworks. Pieces of work from 5 Pointz were projected in the courtroom; a curator was there to comment, and special mention was made of work by Lady Pink and the Chilean artist Dasic FernandeZ – and the effect such works had on visitors and subway commuters who passed the works every day. 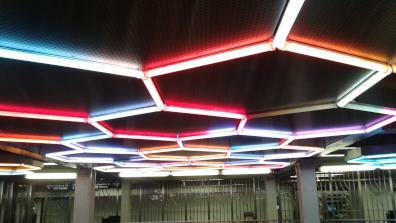 The ‘Hive (Bleeker Street)’, made by Leo Villareal in 2012, is an array of hexagonal ceiling lights at the Broadway Lafayette subway station. Moving cores of red and yellow, like shuttlecocks on a neon loom, describe pathways to the hexagons’ nodes, transforming the entire hive from violet, to white, to red. 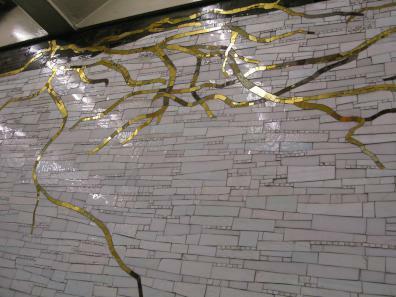 It’s a trip to just stand and stare at this kinetic spectacle over the heads of streams of preoccupied commuters making their way from the B to the 6 train at Bleeker Street. The subway system itself has nodes where multiple lines converge. At 14th Street Union Square waves of New Yorkers pour up and down stairways of granite and cast iron, past murals and mosaics, and along tiled corridors to make the connection with their next train. It is as though someone has kicked an ants’ nest. There is art everywhere and in all forms. Cropping up out on the street as well as Union Square is the little bronze guy from the Life Underground series created by Tom Otterness. Imagine living as a saxophone player or a drummer in a tiny apartment in a 20 storey brick building on Avenue B – and trying to practice at home. While down the road and under the street there is a huge open space with many levels and a continual audience. Horn players, African men with instruments made from enormous gourds, a violinist from Eastern Europe, a young woman with an electric guitar and a tiny amplifier – they are all there performing while people wait on the platforms. Multiple instruments and amplifiers, five and six piece bands with drum kits and horn sections perform in the big subway stations, as do classical pianists and violinists. But probably the most common instrument is a collection of 20 litre plastic buckets. An upturned bucket repeatedly dropped on the tiles by the side of the foot hooked under the lip provides a strong bass, while everything else is created with a pair of drumsticks on the bottoms and upturned rims of the other buckets. It’s a wild sound in the acoustic space of the stations. Crowds gather, take pictures or record on their cellphones, drop a dollar, and move on. Sometimes people just start dancing. Under Bryant Park 2002 is a big piece of commissioned subway art by Samm Kunce and, as its name indicates, it is right under the park itself. The first time I arrived in NYC I was hurrying through a tunnel of white tiles, overwhelmed by the massive riveted steel structure of the underground tunnels, thundering silver trains, and signs pointing everywhere. I was dragging a suitcase from the airport – rushing to catch a train to Brooklyn. The shape of the white tiles caught my eye and as I slowed down to look I realized they were all different. This was no ordinary tunnel; it was someone’s carefully constructed geological record – a real underground passageway. Then suddenly in front of me, snaking down from the green world of Manhattan’s Bryant Park above, appeared glowing golden tree roots. 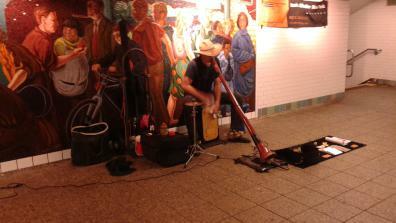 The trip across, or under, the East River is long enough for an uninterrupted performance. 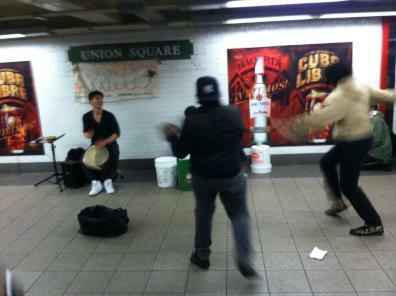 Three or four young guys get on at DeKalb Avenue, check the carriages front and back for cops, then they turn on the boom box in a carry-bag on the floor and start to dance. The overhead chrome bars and the vertical poles could have been made for subway acrobats. Standing somersaults, bumping fists with those watching while hanging from the ceiling, all in the narrow pathway between the double rows of passengers – without a single unintended contact. Commissioner Bratton of the NYPD has recently decided to crack down on ‘low grade lawlessness’, claiming that most passengers don’t like being a captive audience. My observation is that most of them like it. Perhaps he has only paid attention to the complaints. People clap and give money. But the ‘broken windows’ policy, responsible for the death this year of Eric Garner in Staten Island (and the current rage in the streets of NYC over his killer going free), demands action against these miscreants. 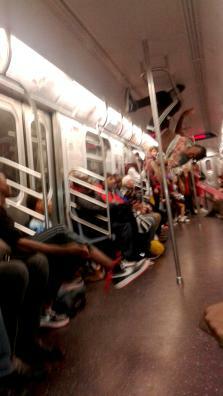 By 1 July the NYPD had made 240 arrests of subway acrobats. Apparently it’s a safety issue. No injuries have been reported. At 2am the subways are a very different place from the daytime. Knowing when the train will arrive is almost an act of prescience. Standing on the empty tiled platform, flirting with the yellow-tiled edge to peer into the dark, the subterranean molecules begin to move differently. It begins with a faint murmur somewhere in the far reaches of the tunnel. In a place that has no wind, no trees or buildings to give it form, a faint breeze starts up. Slight vibrations touch and activate some primitive sensory apparatus. The steel rails transmit through the senses the weight of what is passing, synaptic, over their steel joints. Light begins to flicker on the walls of the tunnel, each one the entrance to an almost endless labyrinth of damp, refuse, rats, ladders and portals leading to entire systems of disused tunnels multiple stories below the surface and, apparently, human inhabitants; individuals and communities rarely seen above ground. The faint breeze becomes a strong wind blowing dead air across the platform; the murmur becomes a rumble, and the rumble a roar. The flickering light becomes the full-on glare of headlamps and a solid piston of metal and light screams out of the dark defying those on the platform to believe it will stop for them. But it does – always.